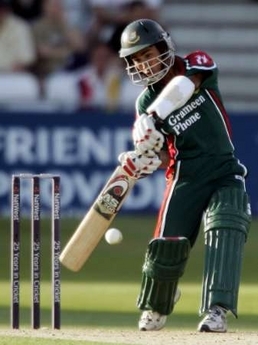 Complete coverage of Bangladesh on their maiden away tour of England. True to captain Habibul Bashar's words, this has been a tough tour for Bangladesh. Before the 2-Test series in English Bangladesh played three tour matches, drawing with British Universties, losing by an innings to Sussex and then drawing the final match with Northamptonshire. They lost the 2 Tests predictably - both innings defeats. However, Bangladesh performed creditably in the second innings of the second and final Test to recover some pride for the NatWest series. Test 1: May 26-30, 1st Test, Lord's - England won by an innings and 261 runs. Test 2: June 3-7, 2nd Test, Chester-le-Street - England won by an innings and 27 runs. Immediately following the Test series Bangladesh is to participate in the 2005 edition of the NatWest series with England and Australia. You can find our complete coverage here. "This will be our toughest tour ever. But at the end of it, irrespective of the results, ours will be a much, much better team. You can't get stronger opponents than England and Australia, and if we can push both teams, who are at the peak of their prowess, and show fight, imagine what wonders that can do to the confidence of a young side like ours."